The population statistics for Israeli settlements in the West Bank are collected by the Israel Central Bureau of Statistics. As such, the data contains only population of settlements recognized by the Israeli authorities. Israeli outposts are not tracked, and their population is hard to establish. In addition to these, Nahal settlements are formally considered military outposts, and their population is counted, but not reported. Once a Nahal settlement becomes a civilian locality, it starts to be reported. While all settlements in the West Bank were advised by the International Court of Justice to be unlawful in 2004, the construction of the West Bank Barrier keeps a significant number of settlements behind it. The largest settlements left beyond the barrier includes Kiryat Arba (population 7,593 in 2012), Kokhav Ya'akov (6,476), Beit El (5,897), Geva Binyamin (4,674), Eli, Mateh Binyamin (3,521), Ofra (3,489), Talmon (3,202), Shilo, Mateh Binyamin (2,706), Tekoa, Gush Etzion (2,518), and Mitzpe Yeriho (2,115). The total number of settlers east of the barrier lines in 2012 was at least 67,702, plus 11,528 in the Jordan Valley. By comparison, the number of Gaza Strip settlers in 2005 who refused to move voluntarily and be compensated, and that were forcibly evicted during the Israeli disengagement from Gaza was around 9,000. The total population of all settlements in the West Bank was nearly 400,000 in 2014, excluding East Jerusalem. As of December 2015, altogether over 800,000 Israeli Jews resided over the 1949 Armistice Lines (including east-Jerusalem neighborhoods), constituting approximately 13% of Israel's Jewish population. Alei Zahav עלי זהב 2133 1643 1300 498 684 424 391 355 1982 W Shomron Western S.
Alfei Menashe אלפי מנשה 7801 7780 7638 7079 5541 5,347 4,580 4,410 1983 W Shomron Western S.
Ariel אריאל 19626 19220 18717 17668 16520 16,053 15,600 15,100 1978 W Shomron Western S.
Ateret עטרת 897 875 894 770 373 349 302 287 1981 E Mateh Binyamin Western B.
Avnei Hefetz אבני חפץ 1836 1759 1709 1553 1127 964 785 695 1990 E Shomron Western S.
Barkan ברקן 1825 1798 1741 1401 1231 1,217 1,150 1,080 1981 W Shomron Western S.
Beit Aryeh בית אריה 4955 4842 4721 3909 3457 2,522 2,380 2,330 1981 W Shomron Western S.
Bruchin ברוכין 919 818 719 n/a 2012 W Shomron Western S.
Dolev דולב 1400 1331 1302 1195 1034 973 880 850 1983 E Mateh Binyamin Western B.
Elkana אלקנה 3884 3898 3945 3587 2963 3,050 2,990 2,940 1977 W Shomron Western S.
Etz Efraim עץ אפרים 2204 2022 1822 760 642 617 525 500 1985 W Shomron Western S.
Ganim גנים 0 139 158 149 1983 E Shomron Northern S.
Halamish חלמיש 1314 1328 1278 1090 941 915 922 1,100 1977 E Mateh Binyamin Western B.
Homesh חומש 0 156 159 163 1980 E Shomron Northern S.
Immanuel עמנואל 3440 3309 3253 2948 2583 2,455 3,040 3,150 1983 W Shomron Western S.
Kadim קדים 0 128 148 138 1983 E Shomron Northern S.
Karnei Shomron קרני שומרון 7369 7102 6905 6284 6280 6,093 5,890 5,590 1978 W Shomron Western S.
Kfar Tapuach כפר תפוח 1166 1071 970 1025 648 523 347 352 1978 E Shomron Western S.
Kiryat Netafim קרית נטפים 929 910 865 690 438 384 249 240 1983 W Shomron Western S.
Ma'ale Shomron מעלה שומרון 1045 1037 1015 837 574 533 527 486 1980 W Shomron Western S.
Migdalim מגדלים 335 305 269 142 150 152 154 150 1983 E Shomron Western S.
Nahliel נחליאל 663 639 665 412 264 248 244 230 1984 E Mateh Binyamin Western B.
Nofim נופים 720 690 638 421 400 402 385 362 1987 W Shomron Western S.
Oranit אורנית 9655 8652 8495 6205 5585 5,316 5,070 4,780 1985 W Shomron Western S.
Peduel פדואל 1746 1682 1622 1185 1113 1,088 885 834 1984 W Shomron Western S.
Revava רבבה 2389 2181 1974 1262 827 703 504 389 1991 W Shomron Western S.
Sa-Nur שא-נור 0 55 52 54 1982 E Shomron Northern S.
Sha'are Tikva שערי תקווה 5921 5811 5638 4727 3709 3,692 3,380 3,220 1983 W Shomron Western S.
Shavei Shomron שבי שומרון 900 897 879 688 606 604 573 569 1977 E Shomron Western S.
Talmon טלמון 4058 3879 3704 2797 1964 1,618 1,250 1,150 1989 E Mateh Binyamin Western B.
Yakir יקיר 2056 1901 1863 1285 984 932 822 765 1981 W Shomron Western S.
Shvut Rachel (est. 1991) – an independently governed settlement which is formally designated as a neighborhood of Shilo. As such, its population is counted within Shilo. 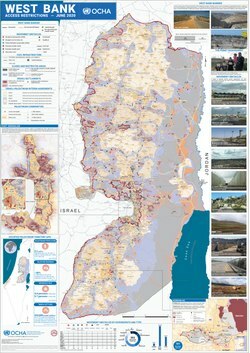 ^ For prior statistics, see Population statistics for Israeli Gaza Strip settlements. ^ a b List of Localities: Their Population and Codes, 31.12.2000. Jerusalem: Central Bureau of Statistics, 2001. ^ List of Localities: Their Population and Codes, 31.12.1999. Jerusalem: Central Bureau of Statistics, 2000. ^ a b W: West of barrier or on side towards Israel. E: East of barrier or on side towards major Palestinian areas. V: Jordan Valley is even farther east. ^ a b c d The settlements of Ganim, Hodesh, Kaddim and Sa Nur were evacuated in 2005 in Israel's unilateral disengagement plan. Wikimedia Commons has media related to Israeli settlements in the West Bank. This page was last edited on 15 November 2018, at 03:26 (UTC).